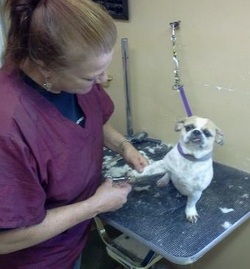 We are a full service professional pet grooming facility. We will alter grooming and styling to fit your needs. Please give us a call to discuss the day care options available! Pedicures: Nail Filing, Clipping, and/or "soft claws"
Specialty Shampoos and Conditioners: Oatmeal, medicated, flea/tick treatments, hot oil (conditioning) treatment. Most treatments need to sit on your pet for up to 10 minutes to be most beneficial. De-shedding Treatment: De-Shedding is the process of removing the dead hair which has already been released from the follicle. We have special conditioners and tools to aid in the hair removal. This is especially helpful in the spring as everyone begins to shed their winter coats.